More and more marketing and e-business directors want to improve their short-term online results. This means they don’t invest in complete update works. Instead, they choose to do expert interventions of a chirurgical nature on very precise pages. Even though we have numerous tools with which to analyze quantitative data (the ‘how much’) on a user track, the time spent on a page,… we also see that there is a lack of techniques when it comes to understanding the ‘why’ of the different types of behavior. This happens quite often: organizations modify a page and the bottom-line results go down, without them knowing the origin of the problem. There is no magical formula to guarantee results – the person finding that formula would soon be a billionaire! – but there are techniques that drastically limit the risks and that allow us to modify pages posing a problem. Before we go into this method, I want to draw your attention to a truth that is all too often forgotten: the only thing to make sure you can meet your objective, is to keep in mind that a well-built screen should generate identical behavior with the majority of users. 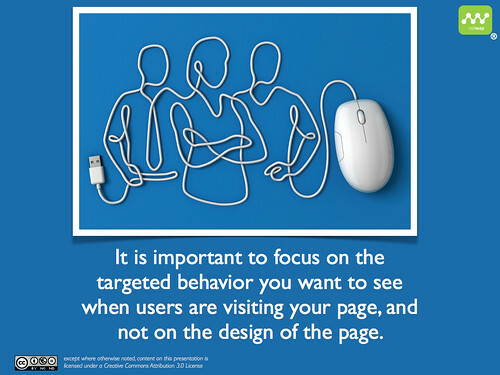 That’s why it is important to focus on the targeted behavior you want to see when users are visiting your page, and not on the design of the page. 1. Clearly define the bottom-line objective you want to meet. This step is fundamental in achieving results. Without a clear objective, it is impossible to adapt your page. Why? Because it allows you to guide your reflections. It will ensure the buy-in of all people involved in the project and it will allow you to find the right resources. 2. Identify the scenarios that users will want to follow and that are in line with your objective. This second step is just as important as the first one. You need to make a difference between the motivation and the needs of the user on the one hand and your objectives on the other hand (managed in step 1). 3. Define the behavior that should be observed on the page (targeted behavior). 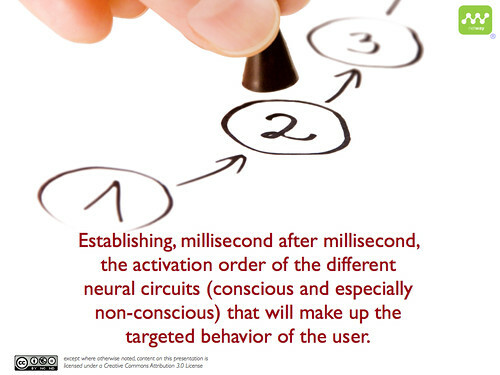 It is in this step that neurosciences start to come into play: it comes down to establishing, millisecond after millisecond, the activation order of the different neural circuits (conscious and especially non-conscious) that will make up the targeted behavior of the user. My vision center receives visual stimuli and perceives the spatial configuration of the different zones of the screen with ease (BA 17, BA 18 & dorsal BA 19). Generates immediate and instinctive pleasure when seeing the screen (Putamen) and doesn’t feel any danger or fear upon seeing the screen (Amygdales). Detects the booking zone and emotionally codes it as being interesting (Thalamus). Also detects the news zone and the zone with tips and emotionally defines them as being pleasant and motivating (Thalamus). Excites my logical brain in order to draw its attention to these stimuli and to focus on the ‘good’ options (Globus Pallidus). Since the task is easy and the targeted stimuli have been identified, my logical brain will need but few attention and working memory resources to plan and coordinate the in-depth analysis of the targeted zones (BA 9). My logical brain receives the spatial data (BA 7) of the relevant zones and will direct the eyes towards the relevant zones in order to collect as much precise data as possible. Since the screen has a good structure, my logical brain will easily draw my visual attention to the stimuli that are perceived as relevant (temporoparietal junction BA 39 and right BA 40). 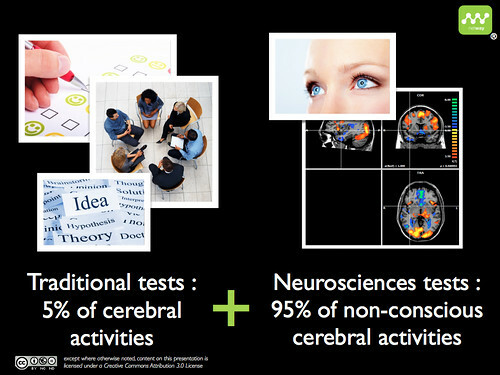 My logical brain evaluates the content and finds the stimuli attractive (BA 31). Since the content of the different zones is easy to read and easy to understand (BA 39 and left BA 40), the high-level reflection is not complex (BA 9, BA 46). The user experience is gratifying (BA 10) and the different zones of the screen have a rewarding value to me (BA 11, BA 12). No aversive information (Insula) blocks my emotional brain from functioning. My emotional brain and my logical brain work well together. My decisions and judgments before performing a task on the screen get a positive evaluation (caudate nuclei) and I don’t perceive any risks (anterior cingulate Brodmann cortex 24 (ventral) and cortex 32 (dorsal)). I have a strong motivation to act and that is translated into my wish to click (BA 6). The created sequence is the ideal targeted behavior. It will be the foundation for the analysis of the gap between the current behavior and the targeted behavior. It also allows me to form an opinion on the problems of the page that needs to be adapted. 4. Analyze the current behavior of users (current behavior). 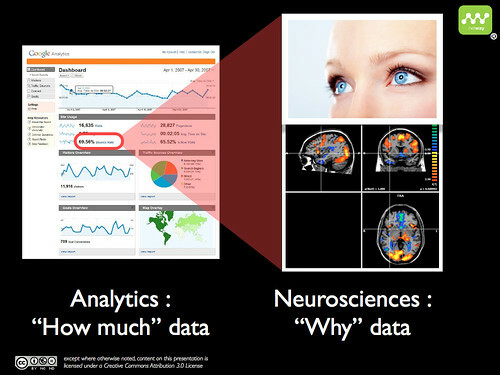 In order to check the current behavior, the techniques can go from the heuristic analysis of the page by an expert in neurosciences to the use of an fMRI or advanced eye-tracking. Thanks to the techniques used in neurosciences, we can accurately measure each zone of the brain that is involved in the current behavior. 5. Adapt the page in order to transform the current behavior into the targeted behavior. After having constructed the targeted behavior and after having analyzed the way users behave on the problem page, all we need to do now, is to adapt the page in order to generate the expected behavior. This may include the geometry of the page, the type of elements, the content and etcetera. 6. Check whether the expected behavior does indeed occur on the new page. By doing objective tests, we can measure the gaps between the ideal behavioral sequence and the sequence generated by the new page. And of course, all this is based on the user scenarios that have been defined in step 2. Thank you for sharing this thought provoking article. I would be very interested in hearing more.